WASHINGTON — Metro hours could change significantly under a series of proposals due to be presented Thursday to the Metro Board. There are four options. One is to maintain the current hours; another would return to the hours Metro had before 2016. The two others each offer cuts and shifts of weekend hours; one of them shifts the system’s opening and closing time by a half hour on weekdays. Of the four options, Metro staff appear to be nudging the board away from a return to previous hours; the conversation is likely to focus on the two alternatives compared to the current plan. 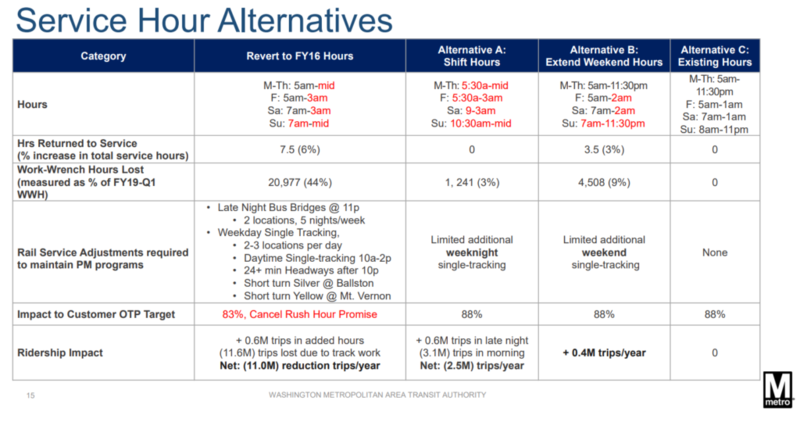 Monday through Thursday: 5 a.m. to 11:30 p.m.
Metro’s presentation to the board sets the current hours as the baseline for comparing alternatives. The first alternative is to shift those hours to provide for later, and in some cases significantly later, opening times each day of the week, in order to run trains later each night. 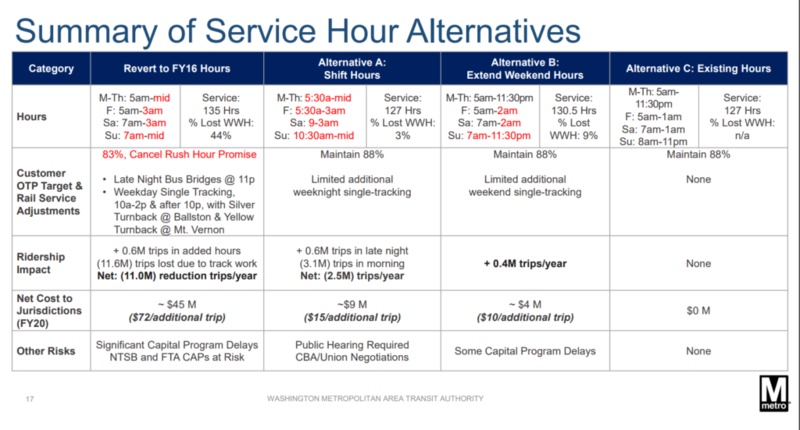 With the added Friday service and reduced Sunday service (net zero for service hours), Metro estimates it could lose about 3 percent of actual track work time, so it would add some weeknight single-tracking to make up for it. Metro estimates the changes would add about 600,000 trips at night, but cut about 3.1 million trips in the morning each year. Saturday: 7 a.m. to 2 a.m.
Sunday: 7 a.m. to 11 p.m. Under that plan, which adds 3.5 hours of service, Metro estimates it would lose about 9 percent of current time when actual work is done on the tracks, so it would add some additional weekend single-tracking to make up for it. Under that plan, Metro estimates it would add about 400,000 trips per year, but certain capital projects could be somewhat delayed. One reason for Metro’s concern about changing the current hours is that the service’s statistical measure of whether riders are on time would drop due to additional single-tracking in the middle of the day, at night, and by adding weeknight track work shutdowns after 11 p.m.
Cumulatively, that’s 7.5 hours more service each week than Metro offers today, which would reduce available track work time by 44 percent, Metro said. The staff find little benefit to making that change. “Current work hours already match lowest 5-hour ridership window,” the presentation said. It bases that conclusion on current ridership, which has been shaped by years of weeknight and weekend track work. Metro believes reverting to the old hours would yield a net annual cost to Metro of $45.1 million. Some items resulting in the extra cost: $10 million for additional bus bridges during late-night shutdowns, shifting hours for later opening times ($9.2 million) and extending weekend hours ($3.5 million). Metro’s calculations, however, did not include any savings from service cuts. Under Metro safety and related policies, it can take up to two hours after the system closes to get crews on the tracks actually working, and they must leave the tracks about an hour before the system reopens. As a result, Metro crews average only about 2.1 hours of actual track work in a typical shift. That, however, is up from just over 1.8 hours per shift three years ago, Metro said. Metro has also been putting a somewhat higher number of crews on the tracks. One reason Metro wants longer closing hours is that certain electrical testing programs require 2.5 hours of work time. See the images below for more details on the proposals.